Home / Deals / Online Deals / Disney Movie Club | Disney DVDs as low as $13.07 each! The Disney Movie Club is back! I have heard so many good things about this club! There is additional purchases required, but the end result is a great deal on some Disney movies! The initial deal is that you will get 4 Disney Movies for only $1.99 each + FREE Shipping with the initial order. You can choose these movies from a wide selection of Disney bestsellers. IMPORTANT: As a requirement for joining the Disney Movie Club, you are required to purchase 5 movies at regular prices within the next 24 months. Regular prices start at $19.95 per DVD and $29.95 for Blu-ray. There will also be shipping charges for these later orders. After you purchase these 5, you can continue to purchase more titles, either on sale or at regular prices, or you can cancel at any time. = $117.62 for 9 Disney Movies + Drawstring Backpack, or $13.07 per DVD. The last 5 can also be the newer titles which you don’t always see on sales right away. So this ends up being a pretty good price for Disney movies. So take this opportunity to add some great Disney movies to your DVD collection. 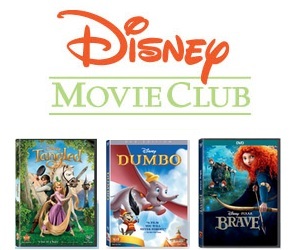 Check out the Disney Movie Club today. It’s been around for quite a while and has had many happy customers! When I joined (a couple years ago), I was able to add a 5th DVD to my first order with the free shipping at half price to count towards my first purchase requirement. – so less shipping costs and a movie at half price to add to that discount!